As the last week of November rolls around, I am reminded of watching Charlie Brown’s Thanksgiving Special every year around this time on TV. Charlie Brown ends up serving Thanksgiving dinner for his friends thanks to Peppermint Patti’s self-invitation when he is really supposed to go to his Grandmother’s for a traditional Thanksgiving meal. Charlie Brown enlists the help of Snoopy to help set up for the feast and, low and behold, a non-traditional fare ensues. When Charlie Brown’s guests sit down to dinner on an assortment of lawn chairs placed around a ping-pong table, his friends are surprised to find popcorn, toast, jelly beans, pretzels, and ice cream sundaes on the menu. After a much disgruntled Peppermint Patti voices her opinion about the food selections, Linus reminds the group about the true meaning of Thanksgiving and how important it is just to be together by retelling the story of Myles Standish and the Pilgrims on that very first Thanksgiving Day . After having recently been to the Towering Pines Camp Reunion this past weekend, I am thankful for the opportunity to get together with camp friends at the start of the holiday season. 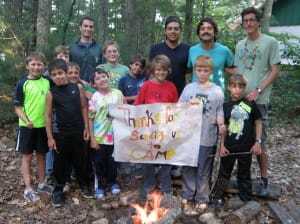 It was so fun to see campers, staff, and alumni gather 3 months after the close of the summer of “All We Can Be in 1-3”. It was a special time for friends to reunite and catch up on the events of our days away from camp while knowing that the summer of “Dare to Explore in 1-4” is now closer than it was in August! 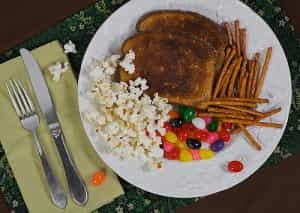 We were even able to share a similar fare to Charlie Brown’s Thanksgiving feast (popcorn, pretzels, cheese sticks, grapes, juice boxes, and other tasty treats!) while huddling close to the TV so that we could watch the highlights of the summer of 2013 on the big screen. Camp memories were relived and shared, stories retold, friendships rekindled, and plans for next summer were formed! HAPPY THANKSGIVING to all campers, staff, alumni, and friends…we are grateful for your membership to the Towering Pines/Woodland Family! Many blessings in the year to come!